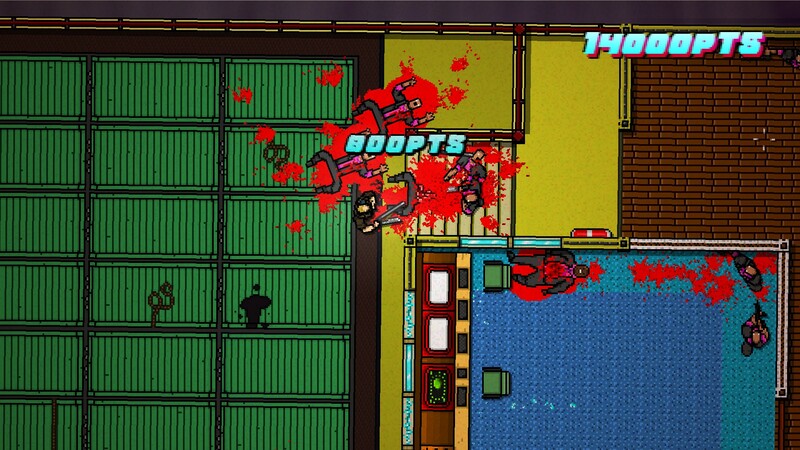 Quick Breakdown: A strong, though flawed, follow up to the ultra-violent Hotline Miami. Wrong Number manages to deliver both more of the same thrilling action and new ideas, but it’s not perfect. 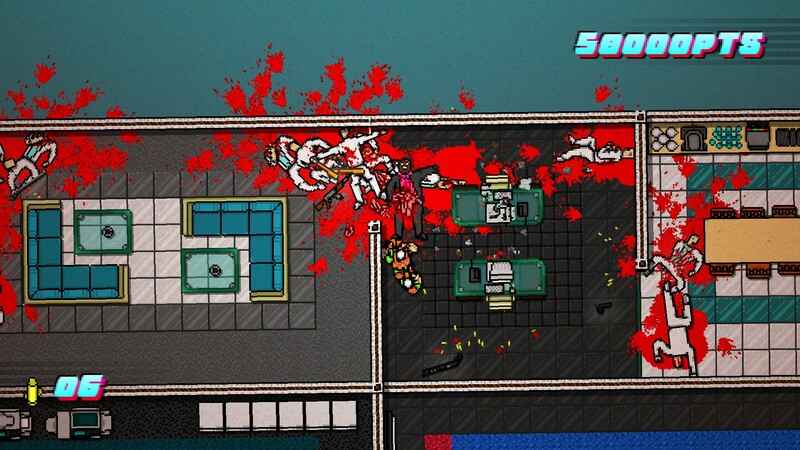 Full Review: The first Hotline Miami was an extremely fun, hyper-violent, top down action game. Needless to say, I loved the game and was eagerly anticipating it’s follow up. The core mechanics of the sequel remain much the same as the first, and as such, I won’t spend too much time talking about them, and instead recommend you read my review for that game. 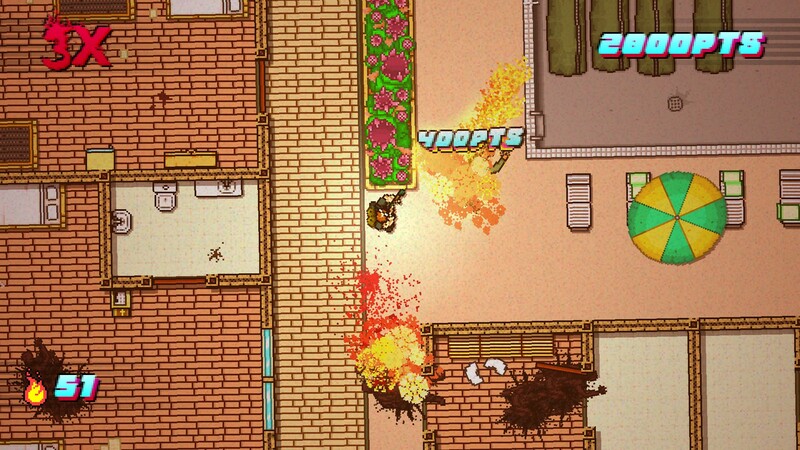 The basics of it are that it’s a top down action game where you must kill all the enemies in the area, through a combination of firearms and melee weapons. Now, let’s talk about what’s different. One notable change is how the gameplay has a much heavier emphasis on gun based combat compared to the first, and melee combat gets a much smaller spotlight this time around. Whether this is a good or bad thing depends on personal preference, personally I’d have liked a slight bit more melee combat in this game, but in the first game I wanted a bit more gun combat in the first, so on the whole it balances out for me and I regard it as a neutral. In the first game you played as a single character and equipped different masks that slightly altered your abilities (excluding of course the trio of post-game bonus levels that let you play as the biker). This time around, you’re given a few different characters that you get to play as. You don’t get to choose your character for each level, but each one does come with their own set of “masks” that you can choose from. (I put masks in quotes because sometimes it’s choosing your weapon, or even the one where choosing a different masks gives you what is essentially different character). The variety added to the game by these different characters and play style is one of the strongest points in the games favour. 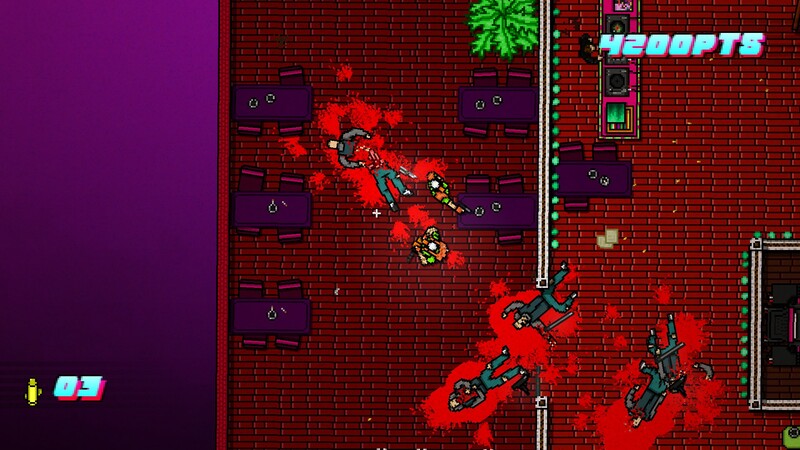 It’s something the game does very well as a sequel, as even with the new additions and changes, the core gameplay mechanics remain intact: frenetic, high speed, blood drenched murder. So let’s talk about these different characters. Now of course, some of the characters play very much like the first game, where you commit your atrocities as straightforward slaughter. On the other end of the spectrum, one of the characters does not kill his targets, and won’t use lethal weapons. Another takes place in flashbacks to a war, where you are given one gun and a knife and must fight your way through enemy territory. When you run out of bullets you must find more ammo to pick up, as with this army character you cannot pick up weapons dropped by the enemy. My favourite character to play as though is the one I made mention of earlier, where the different masks give you a different character to play as, specifically you can choose from 4 different masks with this character. One is able to dodge roll, even under enemy fire. Another has fatal unarmed melee attacks, but cannot use weapons. The final two are the ones I'm particularly fond of though. 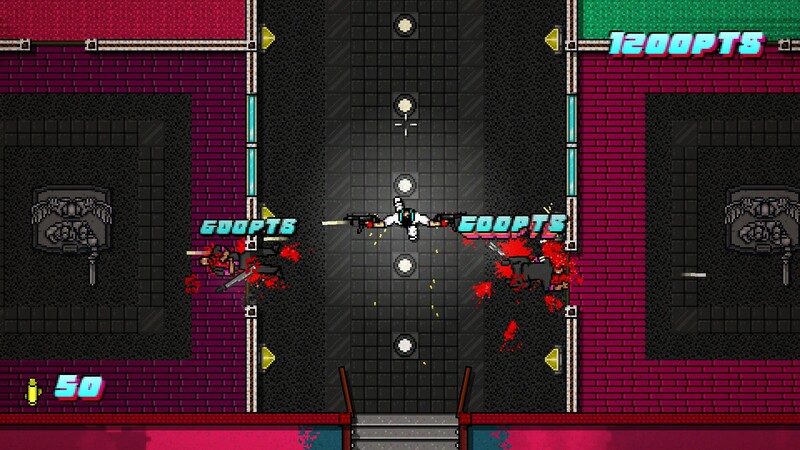 One dual wields machine guns, even being able to point them in opposite directions. If they make a third game I want to be able to dual wield sharks. The other (and my personal favourite in the game) allows you to control two characters at once; one wields a chainsaw, and the other a firearm. 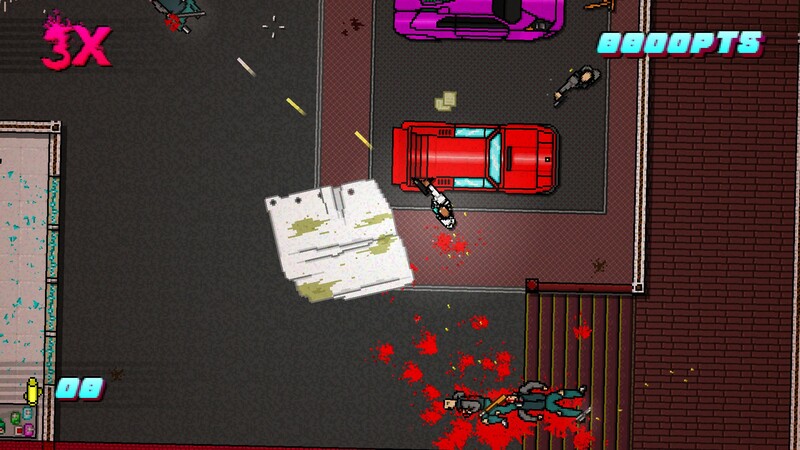 It’s absurdly fun to enact a chainsaw massacre while carrying out a mass shooting at the same time. The first game received a lot of praise for its soundtrack, and I'm in the minority in that I was mostly lukewarm on it, though I dig some of its tunes. Wrong Number’s soundtrack however caught my ear much more than the first, and it is pretty strong throughout the game, so fans of the music from the first game will likely feel the same. The game also makes some small improvements compared to the first game in the form of its options. You can now pick your resolution from inside the game, instead of before loading it up, as well as supporting higher resolutions than the first. It’s now possible to remap the controls, which is something every game should let you do (though I find the default work just fine for this series). 1). There are a lot of times that there are enemies that are off screen and will kill you before you can even see them (even if you’re using the shift key to look further ahead of you, they’re still off screen). This is frustrating and adds nothing to the game but artificial difficulty, and it will lead to many unfair deaths. 2). There are a lot more windows in this game, which enemies will shoot through to kill you. This forces you to be much more careful in proceeding through levels and sometimes interrupts the pace of the game. This is compounded by my first point about the off screen enemies being able to kill you before it’s possible for you to even spot them, as the two issues are not mutually exclusive. While the faults in the level design are the biggest issue with the game, they are sadly not the only ones. When using the shift key to look further ahead in a level, the mouse seems to be much more sensitive than it is when playing normally. This isn’t a problem I recall experiencing in the first game, and while I did adjust to it, it’s still an annoyance, especially given how much more you need to use that feature in this game. Aside from that, the game has some odd glitches that pop up now and then. Enemies (mostly dogs) will sometimes get stuck and spin in circles as if you've already lobotomised them with your pistol. When you play as the two characters, sometimes one of them will bug out and not move with the other character as it should. There are other occasional glitches that sometimes occur during gameplay, but these are the ones I noticed repeatedly. The game was supposed to have a level editor, but as of yet this feature is unreleased. Hopefully it’ll be out soon, as I'm quite interested in trying that (hopefully we can download user made levels online as well). 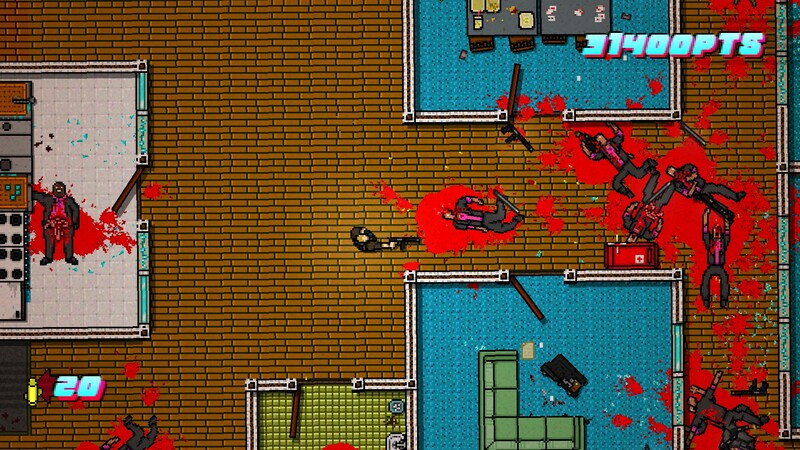 All in all, Hotline Miami 2: Wrong Number gets a few things wrong, but it also gets a lot right. It’s a strong follow up to the first game, and while there are some things about it that are much better than the first game (the character variety in particular), on the whole I think it’s slightly inferior. That said, it’s still a lot of fun, and fans of the first would do well to pick this up. If you haven’t played the first game, then you should absolutely do that, and do so before playing the second. In the end Wrong Number manages to build upon the first game and keep the essentials intact, and it’s certainly worth your time and money.